BOE, which is the biggest display manufacturer in China, is looking to supply its flexible OLEDs to Apple. Its plan is to satisfy Apple, which is thirsty for supply and demand of OLED, by constructing large-scale production lines exclusively for Apple. Because it was heard that BOE’s executives recently visited Apple and shared such business plan, industries are drawn on whether or not Apple and BOE will be able to come up with a contract. Currently Samsung Display is the only one that is supplying flexible OLEDs to Apple. BOE has emerged as a variable since LG Display is currently being mentioned as an additional supplier. According to representatives from multiple industries on the 27th, BOE has set a plan to use its B11 line, which is located in Sichuan, and B12 line that is currently in an investment process as production lines exclusively for Apple. Its exact plan is to produce 70% of flexible OLEDs and 30% of foldable panels from B11 line. From B12 line, its plan is to produce 50% of each flexible OLE and foldable panel. B11 is BOE’s second flexible OLED plant followed by B7 line in Chengdu. BOE is planning to invest $7.04 billion (46.5 billion Yuan) in total into B11 and it started ordering major equipment for front-end processes in this past June. Although BOE has not finalized on its investments for B12 line, it is likely that it will be constructed in Chongqing. BOE has been weighing amount of investments for B11 and B12 lines together and it is understood that BOE already established a separate team exclusively for B12 line. It is heard that BOE presented information regarding B11 and B12 lines to Apple. Although it is not confirmed whether or not BOE’s investments follow Apple’s requests, it is clear that BOE is actively pursuing to receive orders from Apple. In order to be selected as Apple’s supplier, one needs to apply equipment and methods of technologies requested by Apple. One also needs to through a lengthy process where it needs to produce a sample that needs to go through many performance and quality tests and pass final standards. Even if BOE establishes production lines according to Apple’s request, it will not be able to supply its products if it does not receive final approval from Apple. This movement by BOE however is enough to make South Korean display industries worrisome. Apple is currently receiving all of supplies of flexible OLEDs for iPhones from Samsung Display. Because its dependence on Samsung Display is high, it is looking for a new flexible OLED supplier besides Samsung Display. While LG Display has been mentioned as the most likely candidate, BOE quickly emerged as its main competitor. If BOE and Apple become partners, BOE will be able to secure an opportunity that will allow BOE to quickly become one of the leading businesses in flexible OLED markets. Strategies that BOE set in order to go after Apple have not been known to public. It is interesting to see that BOE is looking to produce flexible OLED as well as foldable OLED. Foldable OLED is used to produce foldable display and it is seen as an important technology that is needed to implement next-generation Smartphones or tablets. BOE has carried out R&D on both in-foldable OLED and out-foldable OLED and it introduced prototypes for both in the past. Although BOE’s technical skills in OLED fall behind of technical skills from Samsung or LG, it is currently seen as the display manufacturer with the highest completion level out of Chinese display manufacturers. BOE recently started mass-producing 6th generation flexible OLEDs. It showed off its technical skills by holding a large-scale event last month in order to commemorate shipping of its products. 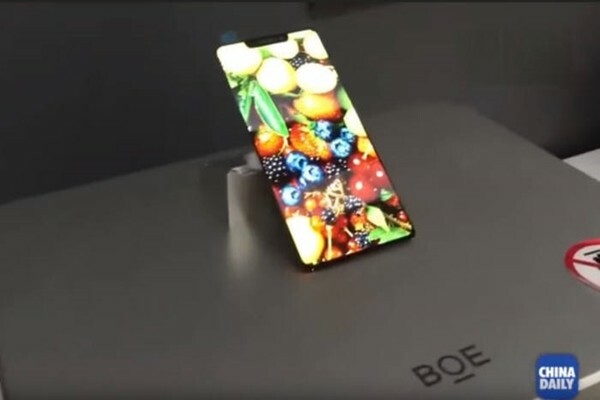 At this event, BOE introduced a prototype of a panel that is similar to notch cut display of iPhone X.